Make decorating a Sweet Experience with Marshmellow Peeps! Caution: Some of these recipes involve the use of craft supplies such as glue. Please do not allow any children to consume Marshmallow Peeps that have come in contact with these elements. Turn an oval or round cake into a charming Easter basket by icing the sides in a basket-weave pattern, and topping it off with your favorite Marshmallow Peeps® and Bunnies. Then scatter Peeps Jelly Beans for a festive touch. Make a cookie cottage using a pint sized milk carton, graham crackers and white canned icing. Simply cover the carton with icing and place graham crackers to form walls and a roof. Decorate with colorful Peeps Jelly Beans and surround with Marshmallow Peeps® and Bunnies for a festive touch. Attach Marshmallow Peeps® and Bunnies to clear fishing line and hang at different lengths from a coat hanger that’s covered with ribbon. Or, for a whimsical touch above your holiday table, just hang Peeps on clear wire directly from your chandelier. Put Marshmallow Peeps® or Bunnies on a popsicle stick (available at craft stores) and “plant” the stick in a small terra cotta flowerpot. Fill the base of the pot with Peeps Jelly Beans and write each guest’s name on the pots with gold paint. Trim a foam or natural wreath with ribbon and garnish with your favorite Marshmallow Peeps® and Bunnies for a charming note. String Marshmallow Peeps® and Bunnies on ribbon or clear fishing line and swag over windows and doorways for a one-of-a-kind holiday dressup. 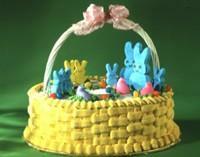 Trim a straw bonnet with clusters of Peeps and Peeps Jelly Beans for a dashing holiday chapeau. Fill a large glass bowl with tons of Marshmallow Peeps® and Bunnies and Peeps Jelly Beans to create an instant centerpiece. Decorate a standard-size 8″ square sheet cake with blue and white icing to form a tic-tac-toe grid. Then place blue Bunnies to make the X’s and yellow Peeps to make the O’s. Create a wonderful, colorful centerpiece for your holiday table. Start with a wicker basket with a Styrofoam flower arranger in the base. Arrange a variety of silk flowers in the basket. Take some bamboo skewers and cover them with green floral tape. Position them among the flowers and place a Marshmallow Peeps® Chick (yellow, pink, white, blue or lavender) on each of the skewers. They nestle right in among the colorful spring flowers, creating a unique visual on your holiday table. Here’s a different idea for a candle holder that’s bright and festive. Take a 3″ Styrofoam flower arranger and cover it with paper twist (any color, found in craft stores). Hot glue Peeps Jelly Beans or Just Born® Jelly Beans around the base and place Spanish Moss on top of the flower arranger. Push a candle taper into the Styrofoam and hot glue a few Marshmallow Peeps® on top of the Spanish Moss. Make several and use tapers of different lengths for an “enlightening” centerpiece. Using a Styrofoam egg form, hot glue multicolored Peeps Jelly Beans, Just Born® Jelly Beans, or Teenee Beanee® Gourmet Jelly Beans around 2/3 of the egg. Nestle the egg in some Spanish Moss, which you have placed in a small, “open” wicker basket. This makes a colorful addition to a coffee table or end table during the holidays. Children of all ages can have a great time stringing their own edible necklaces. All you need are strawberry or black shoestring licorice, Marshmallow Bunnies, cereal with holes, cocktail pretzels, or any other stringable food. Using a skewer or other sharp instrument (an adult should help here), poke holes throughout the sides of the ears of the Bunnies. From here, children can string together many different designs with the stringable food. The necklaces can be tied behind the neck, for a truly sweet fashion statement (if they last long enough). Ingredients: Bittersweet chocolate, toothpicks, Marshmallow Peeps® . Melt Bittersweet chocolate in a double boiler over hot, not simmering, water. Using a toothpick, dip a frozen Marshmallow Peeps® Chick in the chocolate, swirling until covered. Let excess drip off. Place toothpick in Styrofoam so the Marshmallow Peeps® Chick can dry. Once dry, place Marshmallow Peeps® on tray and put in the refrigerator to harden. Arrange your Marshmallow Peeps® (2 to 5 clusters) in a circle facing outward shoulder to shoulder. Drizzle with warm caramel and add a scoop of your favorite ice cream in the center. Serve as a glorious dessert. Using piping hot whole milk, add chocolate/cocoa and stir. Sprinkle cinnamon, them a Marshmallow Peeps®Chick and let stand for 1-2 minutes. Ingredients: Any rolled sugar cookie dough, hot fudge sauce, Marshmallow Peeps® , ice cream, whipped cream. Take rolled sugars cookie dough and make 1/4 inch slices. Place the slices into muffin pans and bake in a 375 degree oven until light brown. Remove from the oven and spoon hot fudge sauce over the cookies. Remove the head of a Marshmallow Peeps® Chick and set aside. Place the body on the hot fudge sauce and return the pan to the oven. When Marshmallow Peeps®have melted, remove from the oven and immediately cover with ice cream to the top of the muffin pan. Place in freezer until hardened. When ready to serve, top with whipped cream and Marshmallow Peeps® head. Gently push a Marshmallow Peeps® Chick on one end of a clean, popsicle stick. Tie a long ribbon under the Marshmallow Peeps® and place next to party plates at any birthday party. Repeat by using alternate color Marshmallow Peeps® Chick (yellow, pink, white, blue or lavender) and complementary color ribbons. Cream Puff: 1/2 cup butter or margarine, 1 cup water, 1 cup all-purpose flour, 1/4 teaspoon salt, 4 eggs. Chocolate Glaze: One cup semi-sweet chocolate pieces, 2 tablespoons butter or margarine, 3 teaspoons light corn syrup, 3 teaspoons milk. Heat oven to 400 degrees. In medium saucepan, melt butter, add water and boil. Add flour and salt at once and stir vigorously. Cook and stir until mixture forms a ball that doesn’t separate. Remove from heat. Cool slightly for about five minutes. Add eggs one at a time, beating with a wooden spoon after each addition until smooth. Drop batter by heaping tablespoons 3″ apart onto a greased baking sheet (shape into ovals with greased fingers). Bake at 400 degrees about 30 minutes or until golden brown and puffy. Remove from oven, split and remove soft dough inside. Cool on wire rack. Prepare vanilla pudding. Put a teaspoon of pudding and a Marshmallow Peeps® Chick into the center of the base and cover. Prepare chocolate glaze. In a heavy medium saucepan, over low heat, heat one cup of semi-sweet chocolate pieces, 2 tablespoons of butter or margarine, 3 teaspoons of light corn syrup and 3 teaspoons of milk. Stir frequently until melted and smooth. Spoon glazes over cream puffs and refrigerates until set. Ingredients: Cake mix or scratch cake ingredients (your choice), white frosting, grated coconut, green food coloring, blue sugar sprinkles, Marshmallow Bunnies (yellow, pink, white, blue or lavender), Teenee Beanee®Gourmet Jelly Beans, Peeps Jelly Beans, or Just Born® Jelly Beans. Bake cake and frost. Color grated coconut with green food coloring. Decorate like a Bunny Patch. Sprinkle blue sugar for the sky, add the dyed green grated coconut for the grass and place several Marshmallow Bunnies in the grass, surrounded by a few Teenee Beanee® Gourmet Jelly Beans, Peeps Jelly Beans, or Just Born® Jelly Beans as Easter Eggs. (Note: If you don’t like coconut, use green sugar sprinkles. You don’t get the same “grass” effect as the coconut, but you might like the taste better). (your choice), white frosting, grated coconut, green food coloring, Marshmallow Peeps® (yellow, pink, white, blue or lavender), Peeps Jelly Beans, or Teenee Beanee® Gourmet Jelly Beans. Bake cupcakes and frost. Color grated coconut with green food coloring. Top with Marshmallow Peeps® (one sits perfectly on a cupcake) and add a few Peeps Jelly Beans or Teenee Beanee® Gourmet Jelly Beans (they make great eggs). (Note: If you don’t like coconut, use green sugar sprinkles. You don’t get the same “grass” effect as the coconut, but you might like the taste better). Another option is to pipe a “nest” of green icing to encircle the top and place a Peep in the center. Sprinkle with colored sprinkles for a finishing touch. The Easter Wreath is an easy-to-make decoration for the front door or to place on the table as a centerpiece. Use a Styrofoam wreath and cover it with paper twist (both items are available in craft stores). Secure the paper twist to the Styrofoam with wire fastener, floral pins or hot glue. Pinch and pick the paper twist to form loops that cover the wreath. Secure the loops with the floral pins. Make a bow at the bottom of the wreath and secure with floral pins and hot glue. Inside the bottom part of your wreath, hot glue some Spanish Moss (available at craft stores). Among the moss, nestle two to three Marshmallow Peeps, securing their positions with hot glue. Hang from a door and let the glue set for several hours. If you plan to hang it outside and don’t want to attract bugs, spray the Marshmallow Peeps® with aerosol hair spray. The second idea for a wreath is to use a Styrofoam wreath and cover it with paper twist. This wreath could hang or sit flat on a table top or credenza. Place small grapevine wreaths around the larger wreath (it’s laying flat). Secure the grapevine wreaths with hot glue. Top each with Spanish Moss and Marshmallow Peeps® . Secure all with hot glue. Fill in the empty areas with paper twist bows and loops that are secured with floral pins and hot glue. A simple straw hat can be transformed into a colorful bedecked bonnet with the application of some ribbon or paper twist, Peeps Jelly Beans, Mike & Ike Easter Treats, and Marshmallow Peeps® or Bunnies. First, wrap the hat with paper twist (it comes in a wide variety of colors) and fashion a ribbon on the back or on one side. Anchor the ribbon with some craft wire and, if necessary, hot glue it into place. Using the hot glue gun, secure the Marshmallow Bunnies and Peeps Jelly Beans to the ribbon in a pattern that pleases you. Let dry for a few hours before wearing. Ingredients: Approximately 20-30 (yellow, pink, white, blue or lavender) Marshmallow Peeps® , 2 cups confectioner’s sugar, 12 oz. Peeps Jelly Beans, or 10 oz. Bag Just Born® Jelly Beans, one small bag shredded white coconut and green food coloring. Take four Marshmallow Peeps® still connected and flatten with palm of your hand to create bottom of the basket. Assemble still connected Peeps around the perimeter of the bottom of the basket (approximately 12-15 Peeps). In a small bowl, mix 2 cups confectioner’s sugar with enough water to make thick icing. Place the icing in a plastic sandwich bag and snip the end of the bag. To hold the sides to the bottom, squeeze the icing around the perimeter of the basket. For any gaps between the basket and bottom, simply place a jelly bean in hole and squeeze icing around. Place basket in refrigerator until icing has hardened, about three hours. When icing has hardened, remove basket from refrigerator. Mix drops of green food coloring with coconut to resemble grass and fill basket with coconut, Marshmallow Peeps® and delicious Peeps Jelly Beans or Just Born® Jelly Beans (Assorted, Berry, Spicy, Licorice) and voila — an Easter Peepster Basket! We’ve gathered some fun tips, recipes, crafts and activities that are sure to keep you hopping this holiday season. For the gourmet cook in your house, add some packets of exotic spices and herbs, plus a new cookbook and cooking utensils and place it in a new copper pot. For the bird lover, place some binoculars, a collapsible cup filled with jelly beans and some colorful books on birds into a backpack making a great Easter Nest. For the handyman, fill a tool belt with essential items like wood glue, nails, measuring tape and Marshmallow Peeps® and Bunnies. For the Tex-Mex barbecue guy, fill a sombrero with Easter grass and add dried chilis, sun-dried tomatoes, special Tabasco and tortilla chips. For the teenage girl, replace high calorie chocolate candy with her favorite bath products, new dangle earrings, and gift certificate for the coolest store in the mall. For the golfer, replace his old white golf balls with bright pastel ones; add some new tees, a colorful new cap, and an appointment for lessons with the golf pro at the club. For the college student, how about an address book (already filled in with grandma’s address), some stamps, pens, and a selection of funny greeting cards. Oh yes, and don’t forget some extra cash. For the young hunters, tie Marshmallow Peeps® together with string and weave a trail throughout the house and grounds leading to the treasure. The romantic would love to follow a trail of flower petals. For the safari kids, leave a trail of stuffed animals they can collect and put in their baskets to cuddle with later. Marshmallow Peeps, Mike & Ike, Hot Tamales, Zours, Teenee Beanee, Just Born, and the shape of the Marshmallow Peeps chick are all registered trademarks of Just Born, Inc.